5 Things You Should Do to Get ..
Stones River Chamber Players g..
MTSU alumnus Luke Laird’s creative partnership with country superstar Kacey Musgraves continues to blossom, earning the pair and their co-writer another Grammy Sunday night, Feb. 11, this time for the year’s best country song. Laird was the only winner among MTSU’s nine alumni nominated for their work on pop, rap, Americana, gospel and country albums, but their efforts still earned plenty of praise plus a pre-ceremony feature on NBC Nightly News. Recognized for their work on multiple projects during the weekend’s Grammy festivities were nominees Michael Anderson, better known by his stage name, Anderson East; BryTavious “Tay Keith” Chambers; Torrance “Street Symphony” Esmond; Jason A. Hall; Wayne Haun; Jimmy Mansfield; Daniel Rowland; and F. Reid Shippen. Laird, a 2001 Department of Recording Industry grad, won with Musgraves and Shane McAnally for “Space Cowboy,” the second single off Musgraves’ acclaimed “Golden Hour” CD. It won not only the best country album Grammy but also walked away with the all-genres album of the year award. Laird’s golden touch, first rewarded with Musgraves when he co-produced her 2013 debut album “Same Trailer Different Park,” also helped her “Golden Hour” project earn Grammy No. 4 Sunday: the best country solo performance for “Butterflies,” co-written by the same “Space Cowboy” team. “This is really unbelievable,” Laird said while accepting the award at the Staples Center in Los Angeles, choking back tears and smiling as he thanked his wife, his co-writers and his colleagues at Creative Nation, his music publishing and management company. You can see a video of Laird’s acceptance speech via Creative Nation’s Instagram account below. 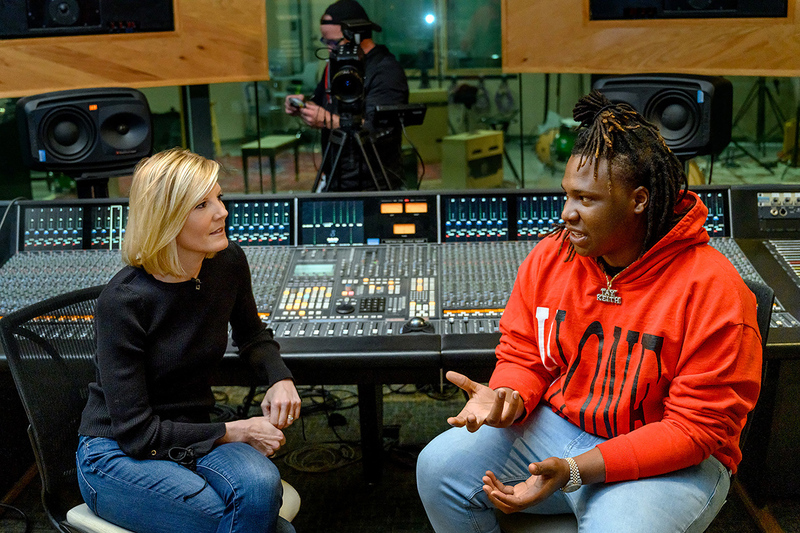 MTSU’s annual Grammy outreach drew the attention of the NBC news program’s weekend anchor, Kate Snow, who visited campus last week to report on the success of the university’s Department of Recording Industry graduates. While at MTSU, she interviewed both Laird and Chambers, a Memphis native who earned his bachelor’s degree Dec. 15 and produced rap superstar Travis Scott’s No. 1 track, “SICKO MODE” with Drake, Big Hawk and Swae Lee. The now double-platinum song was nominated for the best rap performance and best rap song Grammys and is part of Scott’s also-nominated No. 1 “Astroworld” album but lost to competitors Kendrick Lamar, Anderson Paak, Drake and Cardi B, respectively, Sunday night. All three of the students — seniors Trianne Newbrey and Austin Sawyer, and junior Micaela Griffin — raised their hands, smiling. Chambers told Snow during his NBC interview that he particularly appreciated learning about the business end of the music business at MTSU and how to negotiate his producing deals “so they won’t try to pull no funny moves on me, try to screw me over,” he said with a chuckle. You can watch a feature on the program below. 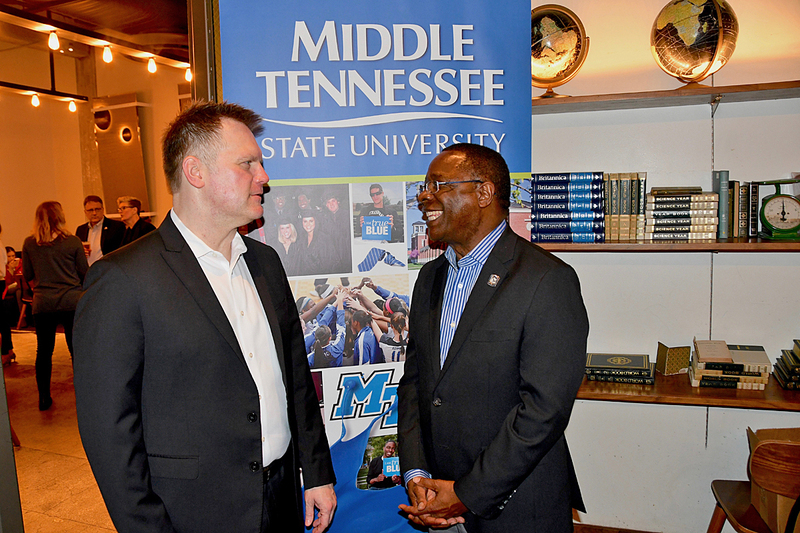 The university sponsored a series of industry get-togethers during the long Grammy weekend, winding up on Sunday night with a co-sponsored reception for Nashville’s Leadership Music members at the Rock ‘n’ Fish restaurant next door to the Staples Center. Six MTSU recording industry students, who were selected by chair Beverly Keel to represent the university, went both backstage and on stage Friday as the Recording Academy prepared Staples Center to host Sunday’s national telecast. 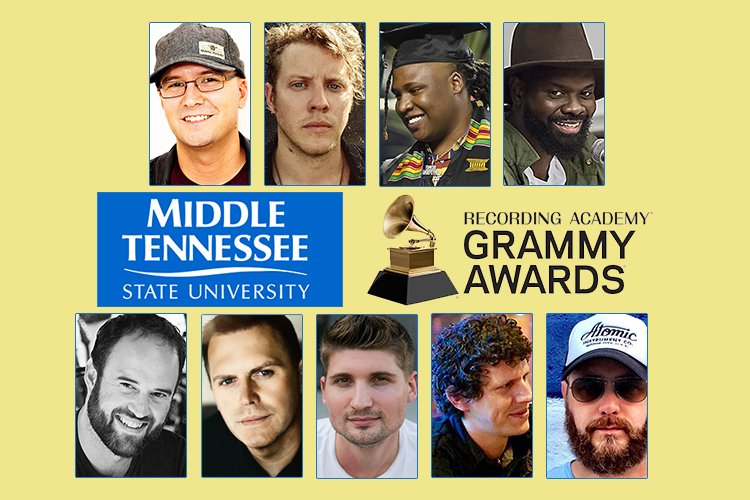 “We’re always proud of the work of all our students, faculty and alumni at MTSU,” McPhee said, “and our Department of Recording Industry in the College of Media and Entertainment consistently tops the lists of internationally recognized music business schools because of the outstanding work of alumni like these Grammy nominees and winners. MTSU alumni are still celebrating their recognition at the 61st Annual Grammy Awards Feb. 10 for their roles in pop, rap, Americana, gospel and country projects. Shown on the top row, from left, are newly minted country song Grammy winner Luke Laird and fellow alumni and nominees Michael “Anderson East” Anderson, BryTavious “Tay Keith” Chambers and Torrance “Street Symphony” Esmond. On the bottom row are alumni nominees Jason A. Hall, Wayne Haun, Jimmy Mansfield, Daniel Rowland and F. Reid Shippen. • 2010 audio production grad Anderson’s song “All on My Mind,” nominated in the best American roots performance category. • “Hussle & Motivate,” a cut on Nipsey Hussle’s best rap album-nominated “Victory Lap” CD, produced by repeat Grammy-winning songwriter/producer and 2003 music business alumnus Esmond. • 2000 recording industry graduate Hall’s engineering and mixing on the Brothers Osborne’s “Port Saint Joe” album, which helped it earn a best country album nomination. • Ernie Haase & Signature Sound’s “Clear Skies,” included in the best roots gospel album category thanks to 2000 School of Music alumnus Haun. • 2014 audio production grad Mansfield’s assistant engineering on Ashley McBryde’s “Girl Going Nowhere” and the Brothers Osborne “Port Saint Joe” project, which put both in the best country album category. • adjunct professor and 2008 Master of Fine Arts in Recording Arts and Technologies Program alumnus Rowland’s mastering engineer work on multi-Grammy winner Seal’s 2017 collection of pop classics, “Standards,” which earned it a best traditional pop vocal album nod. • Kelsea Ballerini’s “Unapologetically” project, which also was nominated for best country album, benefited from 1994 recording industry graduate and multi-Grammy winner Shippen’s mixing engineering talents. You can learn more about the nominees and their work here. MTSU alumni, former or current students, and faculty from across the university have been a part of more than 50 Grammy Award nominations in the last decade. Now, with Laird’s win, eight have won a total of 17 Grammys so far, including four repeat recipients, in categories from classical to country to gospel to bluegrass. 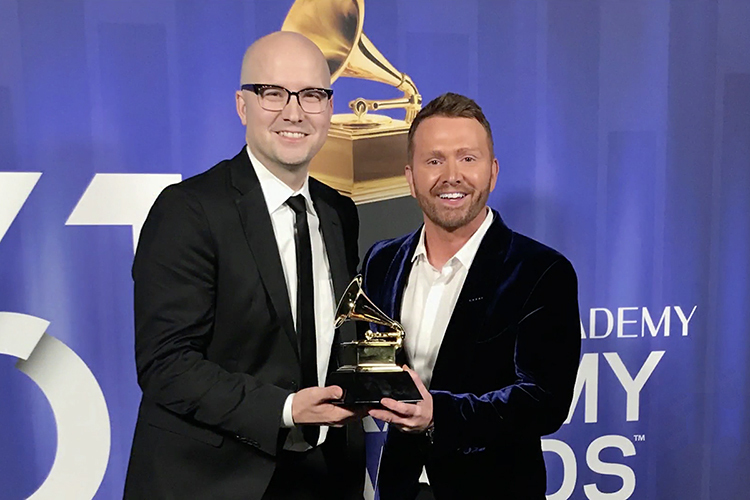 You can read more about MTSU’s 2019 Grammy adventures here.